Film Studies Minor classes offer a unique interdisciplinary approach to the cinema. Through Film Studies analysis courses offered by the English Department and screenings provided by The Film Buffs Program, students examine the history, theory, genres, art, and business elements of film. Only slightly older than a century, this medium compels us to understand its extraordinarily complex integration of light, sound, and narrative. Through the Digital Filmmaking courses, students experience the actual workings of the filmmaking process, from writing scripts with professional screenwriting software through the mechanics of transferring those words to the screen, and finally editing the images and sound into a compelling and functional storyline. Courses in Digital Media expand upon the interdisciplinary approach to the cinema offered by the English Department by combining analysis, theory, and the presentation of creative texts through new digital media, such as e-readers, iPhone applications, and social networking sites. In this manner, by studying historic precedents, artistic intent, and then applying that knowledge to the creation of an entirely new work, Film and Digital Media students at Loyola University are given unique creative opportunities and valuable career experience. Mission: In harmony with the goals of the university, the Arts and Sciences College, and the goals of the Communications and English Departments that support the Film Studies Minor, the goal of the Film Studies Minor is to provide a vigorous and dynamic interdisciplinary program of courses that creates in its students analytical intelligence and the eloquence to articulate that analytical intelligence. This goal is developed through a slate of historically, stylistically, and culturally diverse courses in the Film Studies Minor that are taught by Loyola faculty, not graduate students, in small class sizes, and in discussion format. The Film Studies Minor, in keeping with the Ignatian emphasis upon critical thinking, is comprised of Communications and English Department Film Studies courses that examine all aspects of film technique to explore how this twentieth and twenty-first century medium stimulates and educates our minds and emotions. Film studies analysis is rich in the Jesuit tradition of examining and responding to contemporary and historical cultural products, specifically in the moral and aesthetic examination of film as cultural and aesthetic product. Students learn to analyze, evaluate, and contextualize the techniques, styles, rhetoric, and ideologies of individual films and of bodies of films from American and European countries, considering a variety of genres and cultures in the range of courses offered in the minor. Both the Communications and English Departments emphasize a tradition of superior teaching that engages students in the classroom. Both departments, in their faculty who teach the interdisciplinary Film Studies Minor courses, value teachers in the Film Studies classrooms who are active as scholars in their disciplines. These faculty members inform the content of their Film Studies classes with the insights of their scholarship, thus also providing Loyola's students with active models of professionalism in the Film Studies disciplines. The Communications and English Departments share a common goal of excellence in advising their majors and minors. Through the Film Studies Minor courses, faculty advising of students in these courses, and departmentally-sponsored extracurricular activities, the Film Studies faculty members address each student's academic development in a humanities-oriented, liberal arts environment. Through the Film Buffs Program, the Work-Study Program providing the Film Studies Minor courses with evening screenings of required films, students are able to work for the Film Studies Minor faculty. While working in the Film Buffs Program, students learn first hand from screening the films in the Film Studies Minor courses as well as through taking Film Studies courses about the most important cinema of specific historical periods, cultures and film genres. The Film Buffs Program, through its integral role in the Film Studies Minors courses, creates a true work and study internship/employment opportunity. The goal of the courses in the interdisciplinary Film Studies Minor is to teach students the analytical, technical, and critical skills with which to examine, evaluate, and contextualize films as profoundly complex visual and aural texts. Students taking the Film Studies courses at Loyola learn to understand cinema in the true Ignatian tradition of learning about and thoughtfully responding to the world as intelligent leaders of our community. They learn to examine film as a mirror of and insight into our world. Film Studies Minor courses are open to all Loyola University students. The Film Studies Minor is an interdisciplinary minor comprised of introductory, intermediate, and advanced courses taught by the Film Studies Minor Faculty in the English and Music Industry Studies Departments. These courses offer an exciting, diverse curriculum in film analysis, film genres, film history, film production, and film as a cultural product. Students receive a strong foundation in classical and contemporary cinema. In the Ignatian tradition, analytical skills are emphasized in every course. The Film Studies minor is a 21 credit hour program that offers a unique interdisciplinary approach to the cinema. A wide variety of courses have been designated to participate in the Film Studies minor. Through film analysis courses and screenings, students examine the history, theory, genres, art, and business elements of film. Digital media courses expand upon this foundation by combining analysis, theory, and the presentation of creative texts through digital media such as e-readers and social networking websites. Finally, through digital filmmaking courses, students experience the actual workings of the filmmaking process, from writing scripts with professional screenwriting software, to the mechanics of transferring those words to the screen, and editing images and sound into a compelling and functional storyline. English courses taken to complete the Film Studies minor cannot be used in conjuntion with any English major. An itemized academic program listing and course requriements for Film Studies can be found in the University Bulletin. Students can use the Course Section Search in the Loyola Online Records Access (LORA) system to find courses that are eligible for the Film Studies Program. Before declaring a Film Studies minor, please contact the program director. The Director of the Film Studies program is John Mosier, Professor of English. Film Buffs Program printed schedules listing all films to be screened by Film Buffs each semester. These printed schedules are available outside Bobet 334 (Film Buffs Program office) and throughout campus, including the front desk of each residence hall; all films are open to the public. They can also be mailed to you each semester; call the Film Buffs Program office (865-2152) to request that you be placed on the Film Buffs Program mailing list. Film Studies Minor brochures. These brochures are available outside Bobet 334 (Film Buffs Program office), from the office of the College of Arts & Sciences (Bobet 202) and from Dr. Mary McCay (Bobet 314). Monroe Library Extensive collection of DVDs and Film Studies texts. Students who qualify for Work-Study employment at Loyola University may apply for work as projectionists in the Film Buffs Program. These students are recruited at the Summer Job Fairs, interviewed by the Director of the Film Buffs Program, and the Director makes final decisions about who will work as Film Buffs projectionists. These screenings take place Monday through Thursday nights. Check in for a screening begins one hour before the film is to be screened. 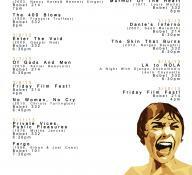 Most films at Film Buffs begin at 7:30. Students are thoroughly trained by the Director of the Film Buffs Program as well as mentored by returning, senior projectionists. In addition to screening and being on call for screenings, each Film Buffs projectionist has an additional program-related job to round out weekly work-study hours, such as updating the weekly voice message on the Film Buffs Program extension, 865-2152, giving the titles, times, and locations of films for the week at Film Buffs; and making sure Film Studies Program Semester Schedules and Film Studies Minor brochures are supplied to all brochure locations throughout the campus, including residence hall front desks, as well as other program-related work. Students interested in working as Film Buffs Projectionists must first qualify as work-study students. See the Supervisor of Work-Study in Human Resources in Mercy 102. Join us for our weekly screenings, including The Friday Filmfests, where you can pick any movie to watch on the big screen! You can find out more about Film Buffs on their facebook page. Student life at Loyola is centered on the Jesuit philosophy of educating the whole person. Find out more.